The last few months I have visited buildings in need of restoration and new stained glass work. I have meandered through routes to little villages, chapels and churches. I have visited new places, talked with people eager to restore or have a new stained glass in their building or home. A rewarding warming time in more ways than one. I have made repairs to a huge tiffany lamp will bring back years of warmth through colour and light. I have also made repairs using conservation techniques on two other Tiffany lamps. 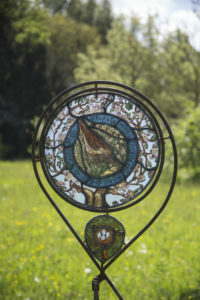 My three exhibitions since April (we are now in July) Cloth road arts, Lacock’s Capability Brown’s landscapes and the Sculpture garden of Bradford on Avon brought lots of interest. There were lots of sales, many questions and learning as we are always learning as artists and teachers, writers and illustrators. Exhibitions are now over for the summer, I am concentrating on restorations in a church in the next few months, at St Anne’s near Lacock. Celtic essence of life right here under our noses, Celtic knot work and crafts spring to mind for an interesting project for the next exhibition ! Great historic Bradford on Avon! My love for animals and birds will continue in my new work. Now with the swallows swooping around the yard outside the studio I am drawing up designs of a stained glass hare painted onto beautiful antique glass for a new window. Choosing subtle and vibrant colours to enhance the hallway of a bright household in Bath. Repairs to a huge tiffany lamp will bring back years of warmth and enjoyment through colour and light. I never thought about looking at exhibitions for stained glass for your windows. My husband and I are looking to adding stained glass to our nursery. We’ll have to look around some exhibitions and locally as well. My open studio starts the 30th September and runs till 8th October. that may help you to make a decision about what you want for the nursery.